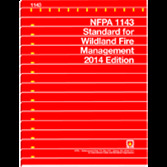 NFPA 1143: Standard for Wildland Fire Management 2014 ed. Reduce fire loss. The 2014 NFPA 1143 guides communities and agencies toward successful wildland fire management. Every year, wildland fire incidents in North America pose increasing threats to adjacent communities, often overwhelming the resources of local first responders. The 2014 NFPA 1143: Standard for Wildland Fire Management provides requirements related to prevention, mitigation, preparation, and suppression of fires in the wildland and wildland urban interface (WUI). Updated figures that provide examples of modern equipment being utilized for wildland fire management such as dozers, helicopters, and air tankers.